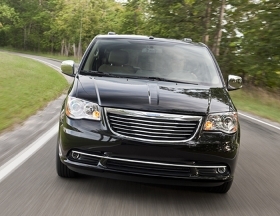 The 2011 Town & Country has been re-engineered to reduce interior noise and improve ride and handling, Chrysler says. Chrysler Group says it will tout craftsmanship, elegance and sophistication when the 2011 Town & Country goes on sale this fall. The minivan features new front and rear styling, interior seats and trim, a V-6 engine and improved driving dynamics. Town & Country highlights were posted Tuesday on Chrysler's media Web site. Additionally, each 2011 Town & Country comes standard with what Chrysler calls SafetyTec, a package of 40 standard safety and technology features, including blind-spot monitoring and rear cross path detection. Chrysler said a particular emphasis has been put on the vehicle's interior. Among the changes: a redesigned instrument panel, upgraded cloth and leather seat materials and new soft-touch door trim. The new steering wheel features integrated controls so the driver can operate the radio, cruise control, hands-free phone and other vehicle functions. The vehicle also has been re-engineered to reduce interior noise and improve ride and handling, Chrysler says. Chrysler's new Pentastar V-6 engine will be under the hood, mated to a six-speed automatic transmission. The engine produces 283 hp and 260 pounds-feet of torque, producing an estimated 17 mpg in the city and 25 mpg on the highway, the company says.